This winter wonderland ornament has the appeal of a snow globe and terrarium, but is made simpler for children. I have put my environment loving spin on this project. 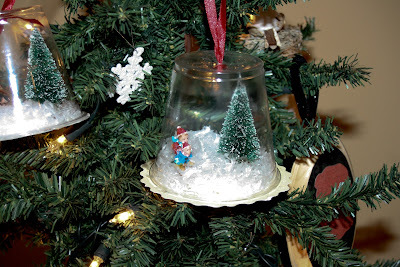 Reuse old toys/Christmas ornaments for the inside pieces. You can buy the snow at your local craft store, or cut up plastic grocery bags for the “greener” route. Use 9 oz clear solo cups as the top, and scalloped edge cardstock on the bottom. For a personalized touch, write the crafter’s name and date on the bottom of the cardstock.